Are you a blockchain developer/consultant or part of a business network evaluating blockchain? You probably already had or will have to deal with infrastructure complexities. Focus on what matters the most and read here how to solve those challenges the right way. Probably you know us already because of Convector, we are the core developers of the open source project which already has over 21,000 downloads. But today I wanted to take a minute to talk about our core platform, why we are creating it, and how you could use it for your next project. More than a year ago we were mainly focused on creating smart contract systems for consortiums and customers. For our first project we had to install a permissioned network in a local data center, therefore we couldn’t use a blockchain as a service offering for the infrastructure. We decided to build an internal tool to automate the deployment, through a console, a Hyperledger Fabric network. We were looking for a less error-prone approach than customizing scripts, configuration files, and doing all things manually. What if I don’t want to use that cloud provider? Why are you centralizing everything to one cloud provider? Have you faced those questions too? While talking with other developers and googling we found out a lot of people were facing the same problem. If you have, you need to sign up here. We decided to take our internal tool and bring it to the masses, to solve what we think is one of the biggest technical challenges for an exponential future of permissioned/federated blockchain networks and for side/hybridchains. We switched our focus to products instead of directly engaging with customers. Enabling other companies like Service Providers or Consultancy Firms to provide solutions without bothering with the underlying infrastructure. Today, there are two main ways to deploy and manage permissioned blockchain infrastructure and side/hybrid chain nodes. Install everything manually, whether with a technical consultant, or every participant doing all the heavy lifting by hand. This is obviously not manageable and doesn’t scale even in the short term. This is why people default to the second option: BaaS. Blockchain as a Service (BaaS). Just like our customers and some mainstream media like Cointelegraph are pointing out already, centralizing things up cut out all the benefits from blockchain and DLT deployments. Those offerings force the whole business network to get an account in the same cloud provider, having to “trust” them, since you never really own the infrastructure. It’s a black-box approach. Not really compatible with blockchain, right? We are the happy middle between doing things manually and giving control away by locking your network up to just one cloud provider. Instead of creating new blockchain technologies, we use any existing blockchain framework. Hence, you can benefit from the decentralized open source evolution of each framework. Instead of us centralizing infrastructure, we enable each participant to bring their own environments in public or private clouds. With this, blockchain networks are never locked into just one cloud provider, making the inclusion of new participants easier while open scalability becomes possible. This also makes possible to have multi-cloud blockchain networks. No lock-in here. Instead of us creating new interoperability protocols, we support the uprising standards providing the customers with the ability to select the one that they trust the most. In subsequent blog entries, I will describe more in detail the platform. We would love to have feedback while we are releasing our first version, so make sure to subscribe here to our Medium blog or to our waiting list for Forma’s BETA. 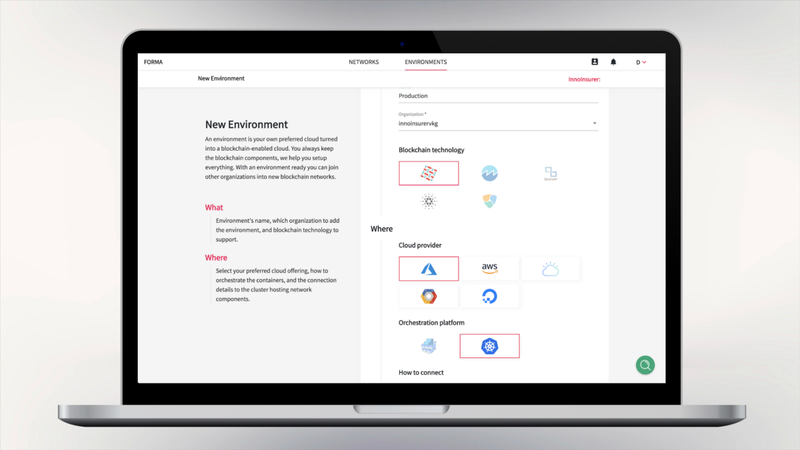 Bring your environment (Kubernetes, Docker Swarm, DCOS) in your preferred cloud provider (private data center, Microsoft Azure, Amazon Web Services, Google Cloud, IBM Cloud, DigitalOcean). Connect it to Forma and decide which blockchain framework to deploy for your nodes (Hyperledger Fabric, Hyperledger Sawtooth, Quorum, NEM, Cardano). Integrate and deploy your DApps anywhere you want. You decide if the network faces the internet or if it goes through a VPN. We stay at the protocol level. We don’t build the smart contract systems. This is in part the reason why we open sourced Convector, so that more developers can build innovations. With Forma, we are currently in a closed BETA phase, but we expect to accept early adopters starting February. Do you want to be the first one to know when the open BETA starts? Please sign up here! Our vision as a company has always been aligned to helping the enterprise adopt blockchain in a faster and more open way. We usually refer to it as making enterprise blockchain mainstream. When a blockchain network is locked to just one cloud provider, participants that don’t want to use “that” cloud provider will stay out of the network’s growth. By definition blockchain is a technology based on networks-effects, adding friction layers only make blockchain projects adoption even harder. Decentralization and robust governance models are key in real-life blockchain networks. If all the network participants can trust a single cloud provider, then why use a blockchain network at all? Operating a blockchain network requires a lot of technical matters, from containers, cryptography, disks, networks, amongst other things that developers and organizations don’t want to care about as long as the infrastructure is robust and secure. We aim to make managing 1 blockchain network as easy as managing 1,000. Your business is probably about giving business meaning to the tech, not being the top experts in blockchain infrastructure. Each blockchain network has a different use case fit. Today companies need to have highly technical infrastructural knowledge per each blockchain framework they use, but what if the best technology is not the one you already know? High entrance barriers will prevent organizations from using the right technology. Developers already have enough to deal with. From a new paradigm to the business understanding, to the whole ecosystem around the smart contracts. Dealing also with the infrastructure is unviable for most companies as they are typically not experts on infrastructure. Also, why spend thousands or their hard-earned revenue in something we can automate for a few bucks? We expect that Forma will be a cornerstone platform for most blockchain networks out there. A consultancy firm is providing services to a consortium. They develop the custom solution and ask each participant to set up their baseline infrastructure, they then ask their customers to make them admins in their accounts with Forma. The consultancy firm can then focus on the governance model, change management, and the development of the whole ecosystem. A startup creates a great industry-specific smart contract system with on chain and off chain functionalities. When going to production they use Forma to deploy nodes for each new customer in their own environment. They deploy and manage their innovative solution for all the participants easily. It is now possible for them to include new participants and sell subscriptions, kind of an open Blockchain as a Service. A group of organizations coordinated by a neutral central authority (like the government) organizes all the participants into creating a blockchain network. Instead of they centralizing everything, they ask each big player to provision their infrastructure through Forma, and then deploy the smart contracts so that each participant can integrate with the system in a transparent way. This allows them to consolidate data in real time and reduce friction layers on the relationship. A developer or a group of companies decide to set up a sidechain which will need a set of limited nodes to be deployed to the participants’ clouds. They use Forma to roll out the required components in record time and then integrate their systems and deploy their smart contracts. We think that the growth of an open and coordinated ecosystem can lead to unthinkable positive future avenues, but these are the common use cases we have found up to today. We do believe and have experienced that blockchain is certainly a transformative technology. But the real change in the world won’t be possible until creating a real distributed and decentralized blockchain network is as easy as creating a database today. Blockchain technology presents multiple challenges for its adoption, but just because the infrastructure is hard it doesn’t mean that we have to accept a less than an optimal solution like Blockchain as a Service offering. We believe that with Forma and Convector we are helping developers focus on what matters the most so that they can go out and transform the world for better. While organizations can innovate and transform their industries without the typical data silos that blockchain comes to fix. What do you think? Let us know in the comments section or email us at beta@worldsibu.io! If this is something you feel that may add value to you, sign up here to be the first one to hear from us when the open BETA starts.